EVERETT – Austin O’Banion has had a tough go of it so far this season, but he came through in a big way on Tuesday. 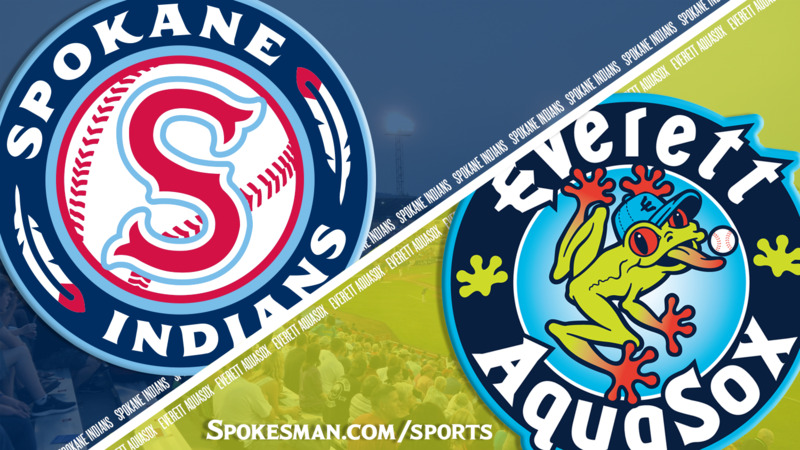 O’Banion crushed a two-run homer in the eighth inning and the Spokane Indians beat the Everett AquaSox 6-3 in the second of a three-game Northwest League series at Everett Memorial Stadium on Tuesday. It’s the first win for the Indians (13-19) on the road this season in 13 attempts. The 23-year-old outfielder hit .191 for Low-A Hickory earlier this year. When the Texas Rangers decided to promote No. 17 prospect Miguel Aparicio to the Crawdads, the club returned O’Banion to Spokane – where he played in 54 games last season. O’Banion entered play 1 for 23 with Spokane in eight games. Starter Jake Latz (2-1) went seven innings and allowed three runs (two earned) on three hits and a walk with five strikeouts. The Indians grabbed an early lead. Jax Biggers led off the first inning with a single and J.P. Martinez was hit by a pitch by Everett starter Max Roberts. Two outs later, as Jonah McReynolds ripped a double off the wall in right to plate two. Everett (17-15) got one of those back in the bottom half on Josh Stowers’ homer down the left-field line – his second homer in as many nights and fourth of the season. Stowers was the Seattle Mariners’ second-round pick in this year’s MLB Draft. Latz baffled Everett until he got into trouble with one down in the seventh. Connor Kopach drew a walk and went to second on a wild pitch. Stowers lashed a hard ground ball over the bag at third for a two-out single, and Diosbel Arias made a diving in foul territory to keep the runner at third. But a wild pitch got away from catcher Scott Kapers and Kopach scrambled home, with Stowers moving to third. Another wild pitch allowed Stowers to score to make it 3-2. The Indians loaded the bases with one down in the seventh as Kapers struck out but reached on a wild pitch, Cristian Inoa singled on a ground ball and Biggers walked for the third time in the game. After a pitching change, Martinez went to a full count before being called out on strikes on a curveball. Benjamin Onyshko uncorked a wild pitch to Curtis Terry and Kapers avoided the tag to sneak into home plate for the tying run. Terry walked to load the bases again. Onyshko walked Arias on a 3-1 pitch to put Spokane up 4-3, but McReynolds struck out looking to end the rally. In the eighth, Joseph beat out an infield single and O’Banion crushed a 1-1 offering for his first Indians homer of the season. Emmanuel Clase struck out three and walked three in two hitless innings for the save. Bench coach Carlos Maldonado handled managerial duties as manager Kenny Holmberg was with his expecting wife awaiting the birth of his first child and her second. By the numbers: Biggers went 1 for 2 with three walks. McReynolds went 2 for 5 with two RBIs. Arias went 1 for 3 with an RBI and two walks. Lebron moves up: RHP David Lebron was promoted to Double-A Frisco. The righty, 24, allowed one earned run with 16 strikeouts over seven appearances and 14 2/3 innings this season. Published: July 17, 2018, 10:24 p.m.